Spring is here and new run shoes are a plenty. Christmas takes place in December but I have to say, if you are a runner, February is stepping up to be a great month for a few surprise presents. 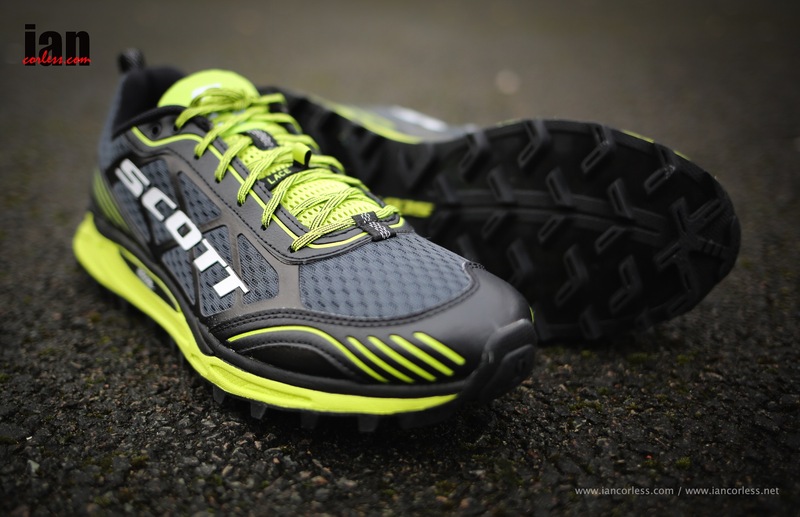 Recently I have had new shoes from The North Face (Ultra MT, Cardiac and TR2, the Salomon S-Lab Sense 4 is due to arrive any day and several weeks back I looked at the Scott Trail Rocket and mentioned the Kinabalu. 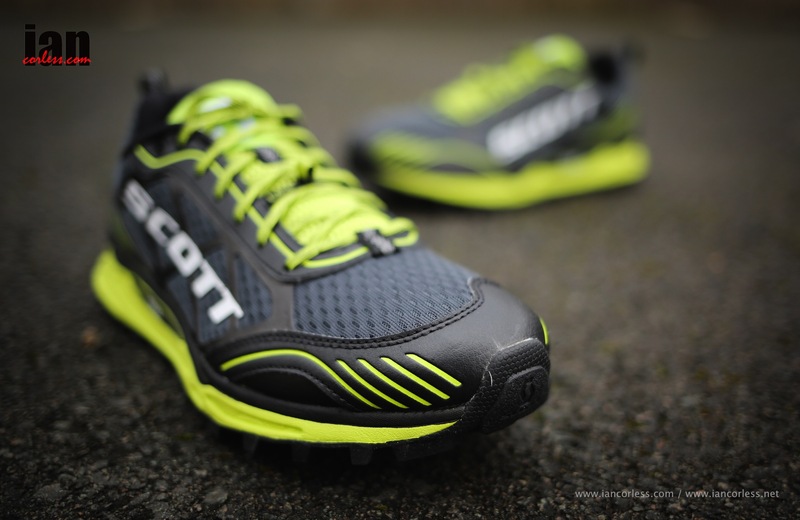 Today we are taking a look at a new shoe from SCOTT, the KINABALU SUPERTRAC. This is a shoe I asked Scott to make some 12-18 months ago! Having used and loved the Kinabalu (Here) I pleaded with them to come up with an 8mm drop shoe with a more aggressive sole. They have only gone and done it! This shoe is a winner! 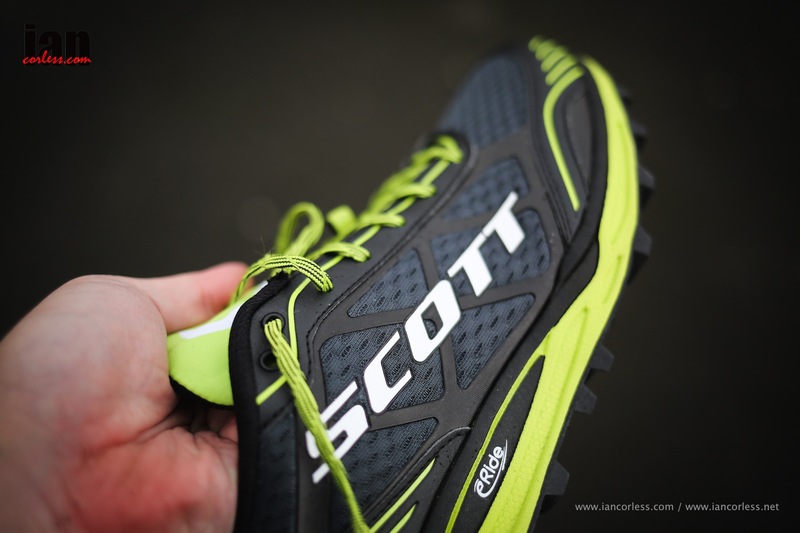 Looking at current shoe trends, Scott like The North Face, Salomon and other key brands have realised that a lower drop is the way forward. For many companies, 8mm provides that sweet middle ground. New Balance, TNF and now Scott have confirmed this while Salomon pave a way with 4mm and 6mm drop shoes. 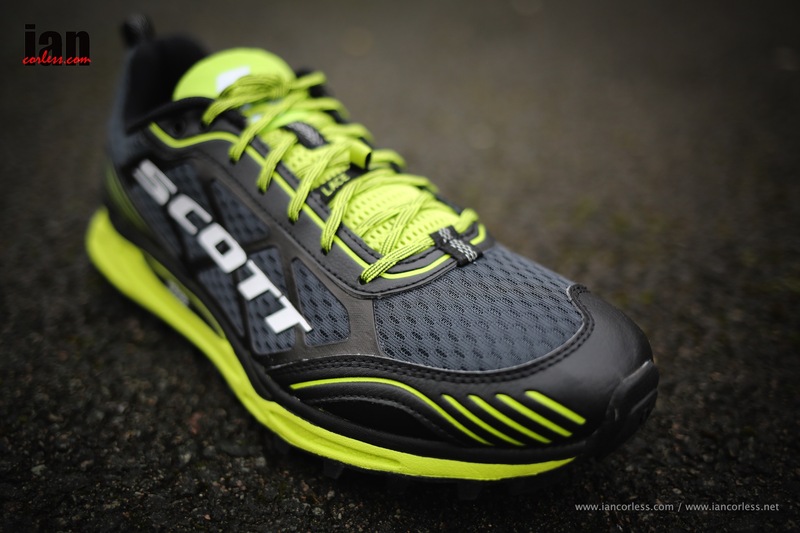 As mentioned previously, if you are after a fast trail shoe (for dry conditions) and with a lower drop (5mm), you can’t go far wrong with the Scott Trail Rocket. 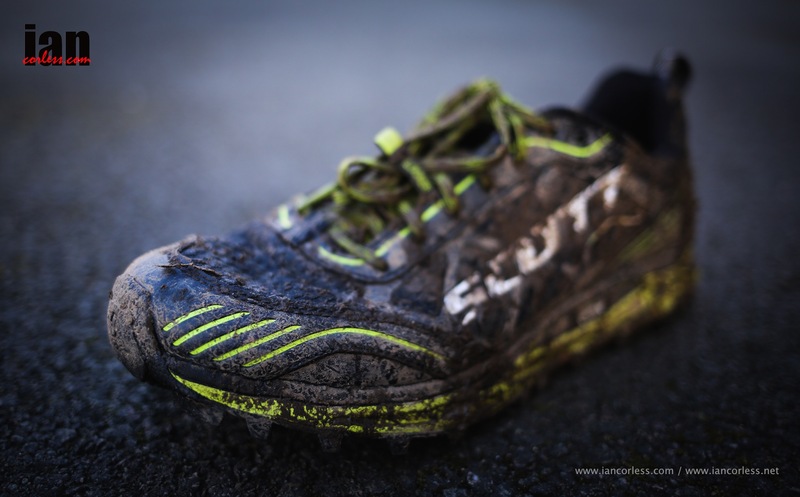 But if you are after a shoe that can handle mud and a multitude of different conditions then the 8mm drop, Kinabalu Supertrac may be for you! Fits like a glove, laces up nice and tight, hugs the heel without rubbing, the toe box provides a secure hold of your foot with a precise feel and grip is AGGRESSIVE! The Kinabalu Supertrac introduces a new level of technical shoe and a completely new concept of superior grip. 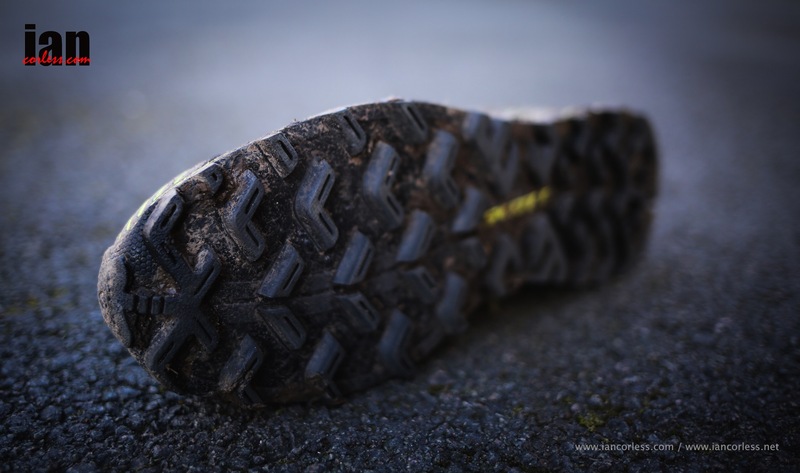 The shoes are designed to match the needs of trail and mountain runners in the most extreme conditions : mud, snow, rock and mountain! Delivering great traction on soft and rough surfaces and all within a shoe that provides great comfort, cushioning and with an 8mm drop. It comes as no surprise to me really. As I said previously, I loved the Kinabalu. I just wanted more grip and lower drop. Scott have that now provided me with that, so this can only mean one thing: happy runner! If you are familiar with the Kinabalu, this ‘Supertrac‘ version will feel familiar. The tongue is padded, extremely comfortable and the laces are thin and textured. Importantly, the laces stay tight when tied. 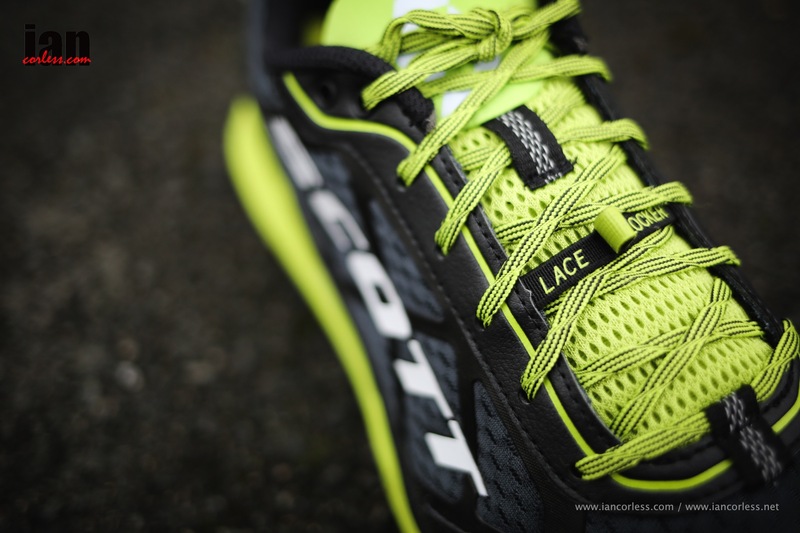 Scott’s ‘Lace Locker‘ is present and this provides a no nonsense simple solution to store loose laces. The shoes are neutral fitting and cushioned using AeroFoam+ which provides additional cushioning, increased durability and great rebound. The upper is breathable mesh with synthetic overlays and the lower part of the shoe is constructed from EVA and rubber. 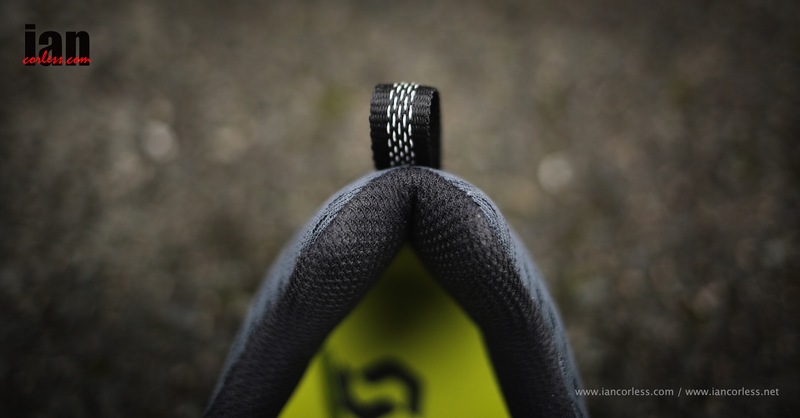 The toe box is reinforced extremely well and will withstand some serious contact with rocks or unwanted obstacles. I usually prefer a wider shoe and the Supertrac allows for this but still holds my forefoot firm and without hot spots. 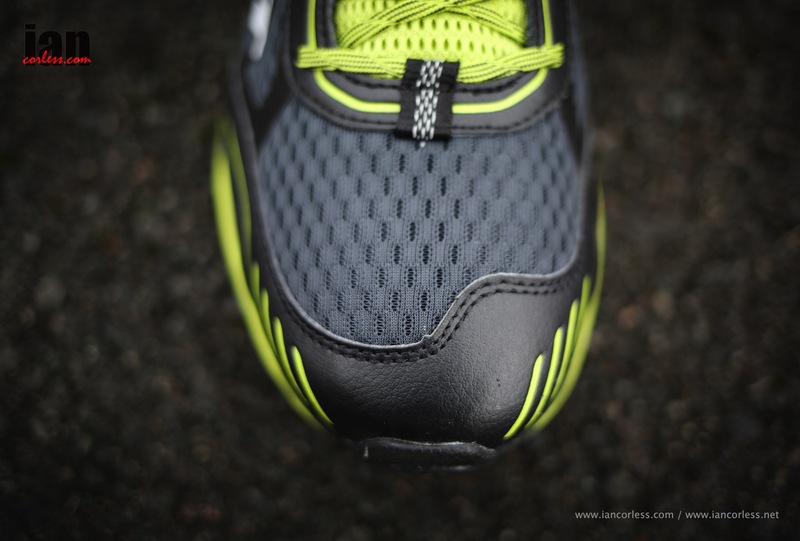 The heel is injection moulded, plush, soft has no harsh contact points and provides a secure firm grip irrespective of when running on the flat, descending or going uphill. I had no movement at all. 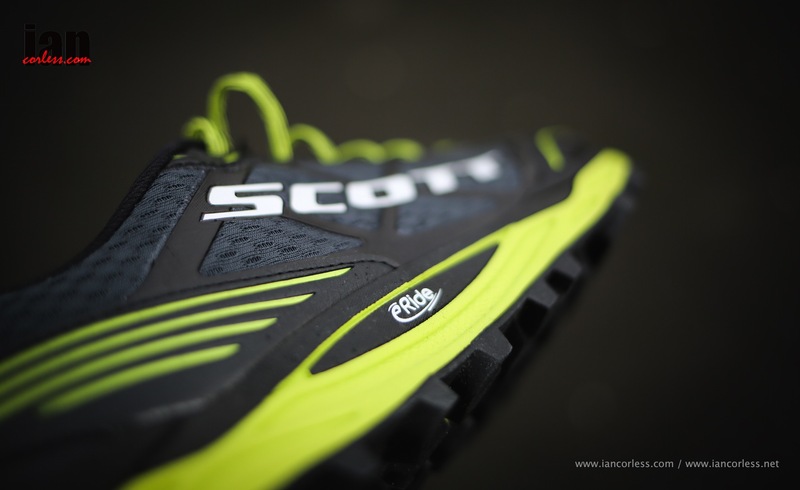 As one would expect, Scott carry over many features that we have seen on other shoes in the range. The eRIDE is a ‘rocker’ platform that is designed to guarantee a more efficient foot strike. If you already strike mid to forefoot, this may be less noticeable. However, if you are heel striking, the rocker really does roll you forward on to your toes. Think JCB meets running shoe. The outsole is extreme and made from a superior wet traction rubber compound that works really well on a multitude of surfaces. I am really impressed with just three to four runs*. 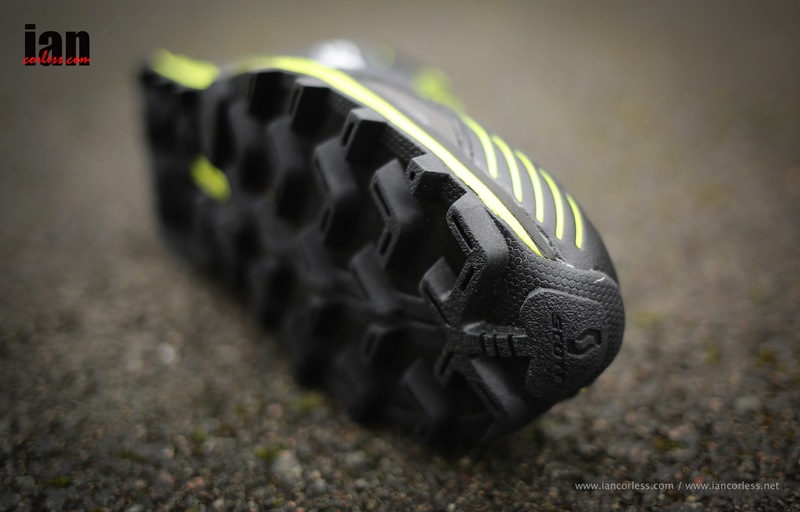 If you are looking for an out-and-out trail beast with great cushioning, 8mm drop and a comfort rating that will least all day, the Kinabalu Supertrac is going to be a serious contender. It has very quickly become my ‘go to’ when heading out on my local muddy trails. Expect to see Marco De Gasperi, Elisa Desco and Joe Gray using this on the trails and mountains of Europe and the USA. This entry was posted in Equipment Reviews, Uncategorized and tagged best grip. 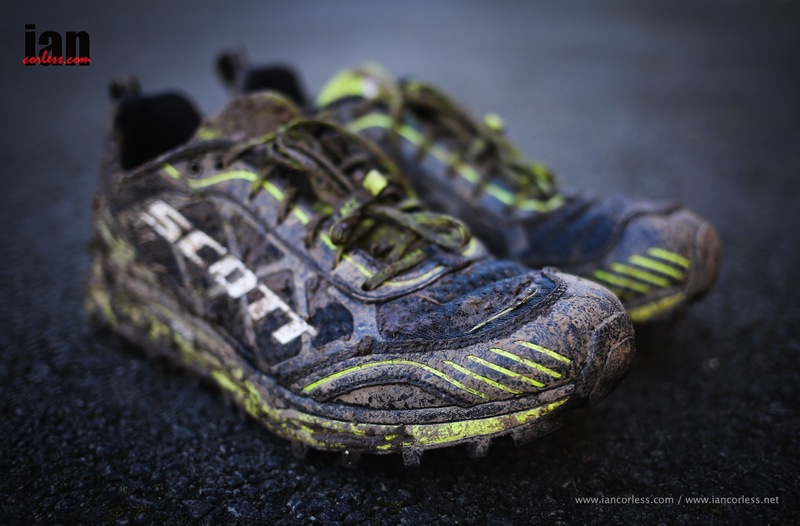 superior grip, elisa desco, Joe Gray, Kinabalu, kinabalu supertrac, Marco de Gasperi, Mountain, new shoe from scott, Running, Scott, supertrac, trail, trail running shoe from scott, Ultra by talkultra. Bookmark the permalink. hello. can u tell me about the sizing? usualy trail shoes need a half size up. how is it in this case? Shoe measurement depends on what is normal for the individual. I wear UK9.5 shoes and all my run shoes are UK9.5. – I always aim for a thumb nail width above by big toe. One also needs to consider shoe width.